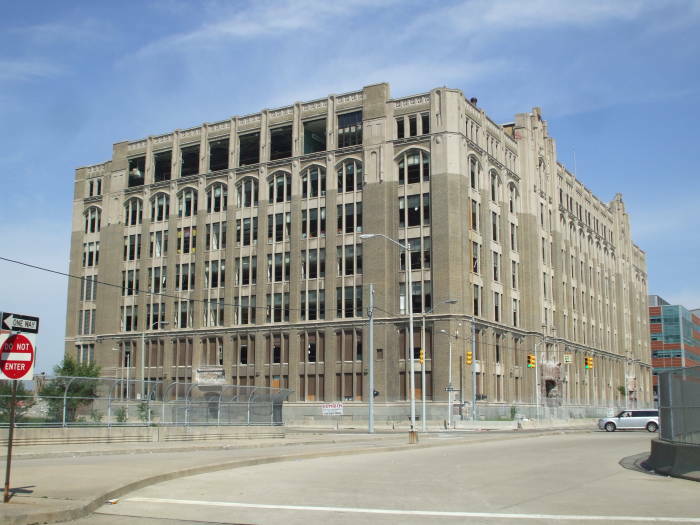 I am continuing my tour of post-apocalyptic Detroit and its amazing architecture. I'm starting in this area where Grand River Avenue crosses over I-75, the Fisher Freeway. I'm at Cass Technical High School. OK, so things aren't quite as bad as they appear. 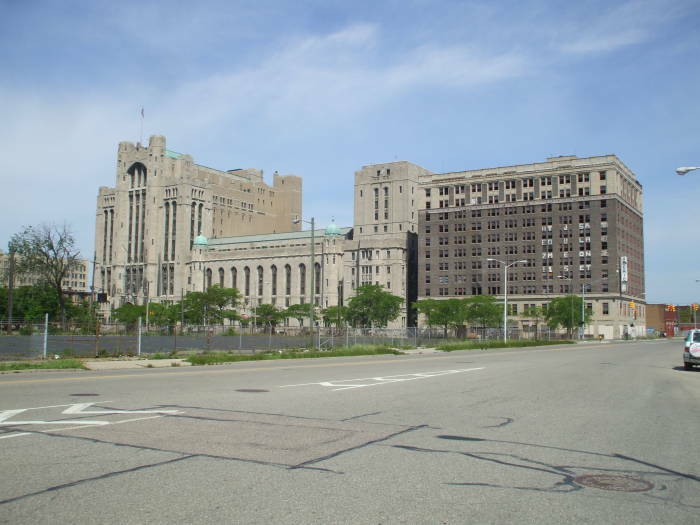 This is the old Cass Technical High School. The modern replacement is just to its north, barely visible in the distance at right. However, the enormous building with no windows and surrounded by chain link fencing fits the architectural theme. 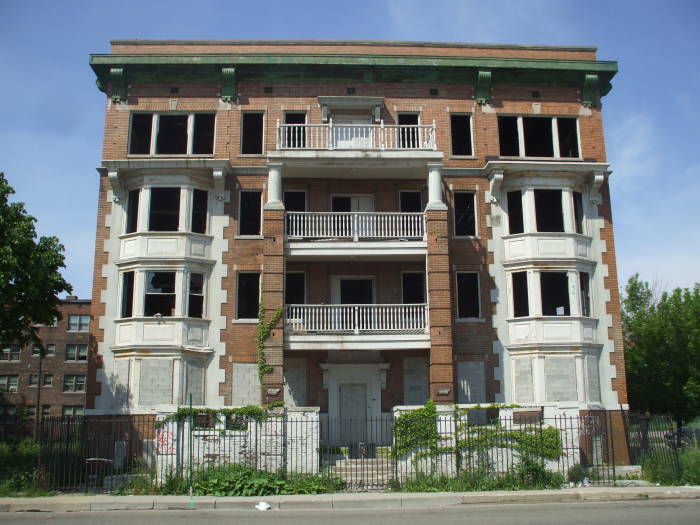 Some nearby apartment buildings on 2nd Avenue, as seen below, seem to have been condemned. Or at least abandoned. This apartment building, the Atlanta, dates from a time when structures like this were given names. The name is carved in stone above the now boarded up main entrance on the lowermost porch. There was a time when cities had lots of these buildings with broad porches on several levels. 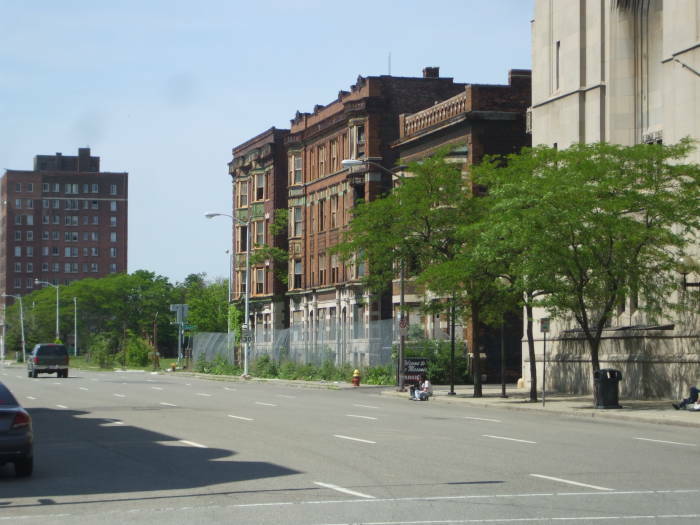 Continuing north on Cass Avenue, we approach a large complex made up of the Detroit Masonic Temple, at far left; its theater, to its right; then the Shrine Club building; and the former American Hotel at right. This is the world's largest Masonic Temple. They placed the cornerstone in 1922, using the same trowel George Washington used when setting the cornerstone of the U.S. Capitol building in Washington, D.C. The temple was dedicated in November, 1926. 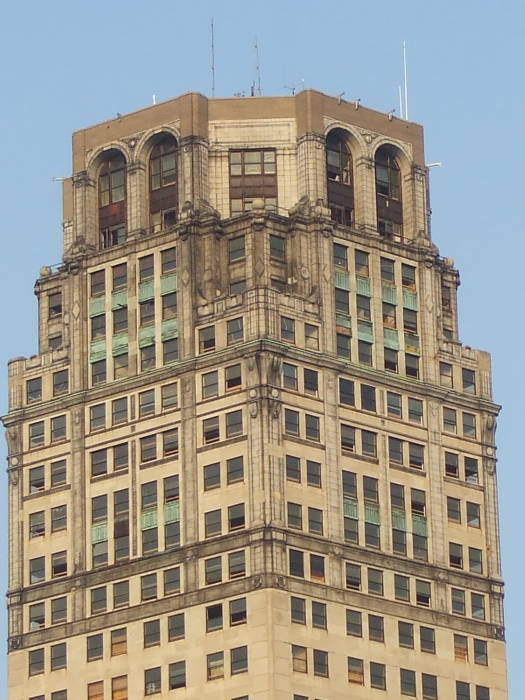 The Masonic Temple has 14 stories and stands 210 feet tall. It contains 1,037 rooms. The Masonic Temple Theatre, relatively low at seven stories, seats 4,404. There is also a 1,586 seat Scottish Rite Cathedral, a drill hall used for roller derby events and conventions, and two ballrooms accommodating up to 1,000 people. The east end of the Masonic complex, the rightmost of the light colored limestone in this view, is a ten story Shrine Club. 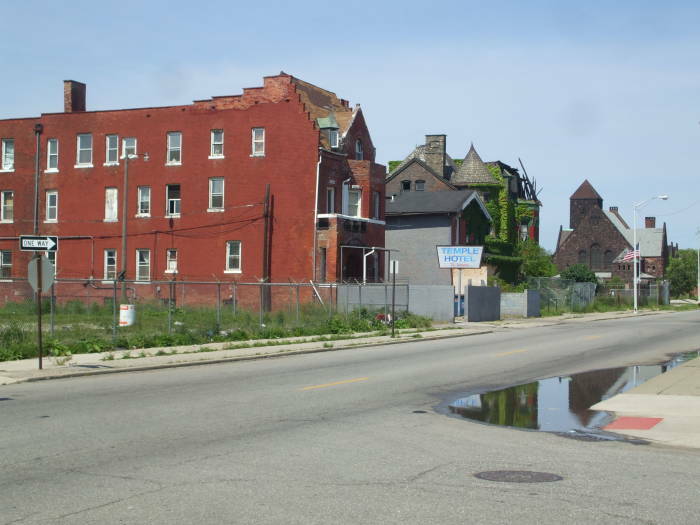 Looking north on 2nd Avenue, beside the Masonic Temple, we see more fenced off and abandoned apartment buildings. 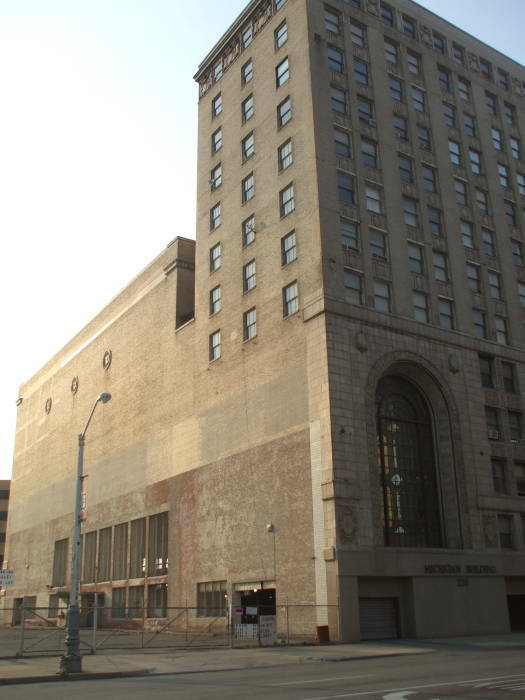 The American Hotel fills the rest of the block facing Temple Street between 2nd Avenue and Cass Avenue. 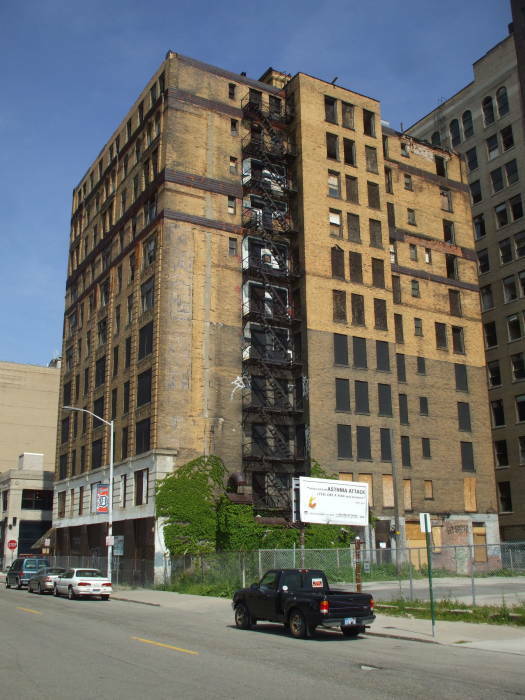 An 11 story hotel with 300 guest rooms, it has seen better days. It was built in 1926. 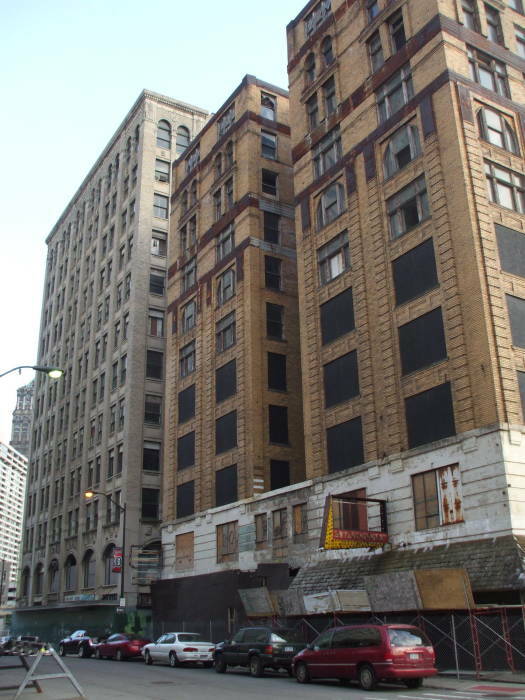 Now it is mostly boarded up at street level, and missing at least parts of most of its windows above. Continuing the theme of fraternal organizations along this street, the hotel was initially operated by the Knights of Pythias and called the Hotel Fort. 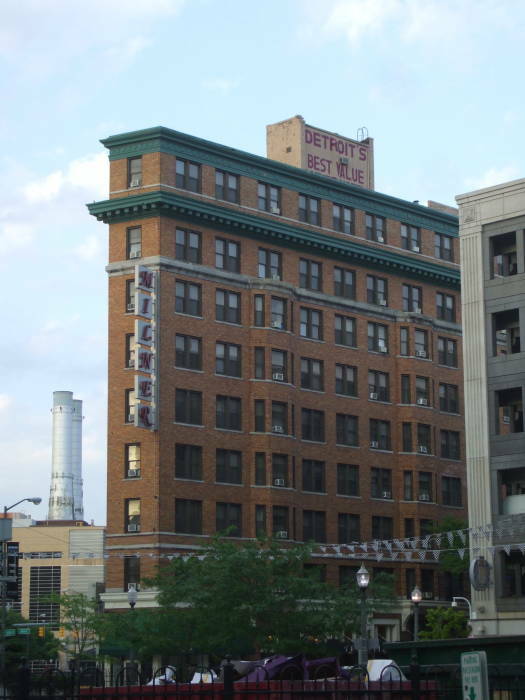 The Detroit Trust Company ran the hotel after 1933, when they changed its name to the American. It closed in the early 1990s. The code is the following. Do we read by rows, by columns, or it is some form of transposition cipher? 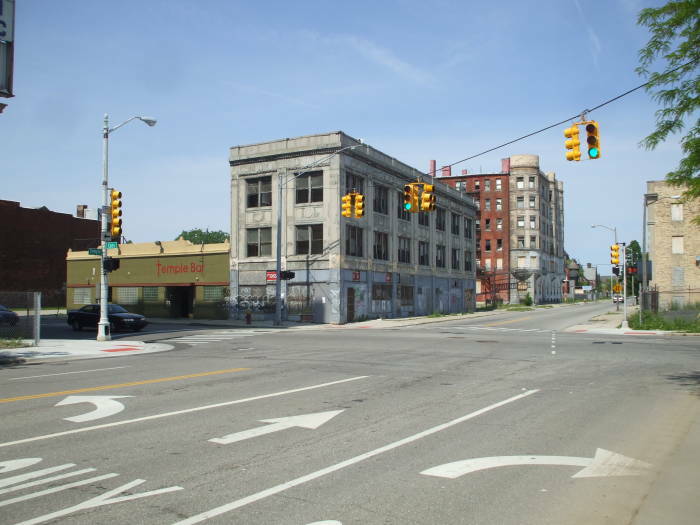 We are continuing east on Temple Street, crossing Cass Avenue at the intersection by the American Hotel. This building has seen much better days. Not only are the windows broken out, but the woven plastic sheets fastened inside the windows have worn out. This apartment building has tower shaped front corners. Its central stairway had views out over Temple Street. A stencil graffiti artist inspired by Banksy has had a go at the plywood blocking the entryway. 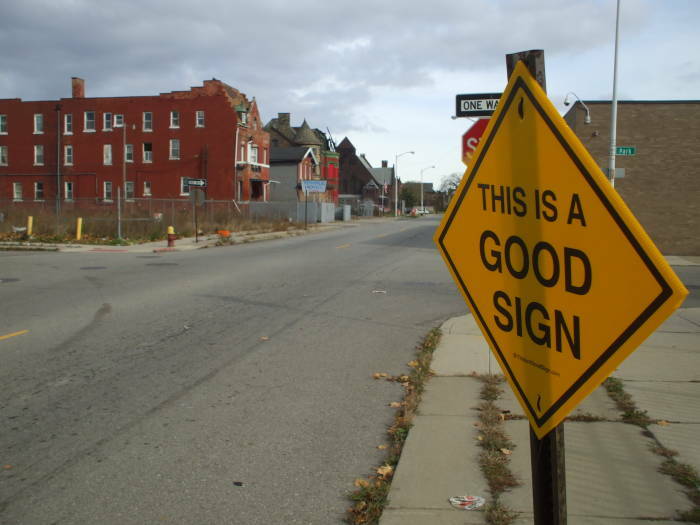 Perhaps the sign itself is good. But the scene does not bode well. It is not a favorable augury. We have crossed Park Avenue and turned to look back to the west on Temple Street. The Temple Hotel, just east of Park on Temple Street, appears to still be in operation. The windows still have glass, which is unusual in this neighborhood. 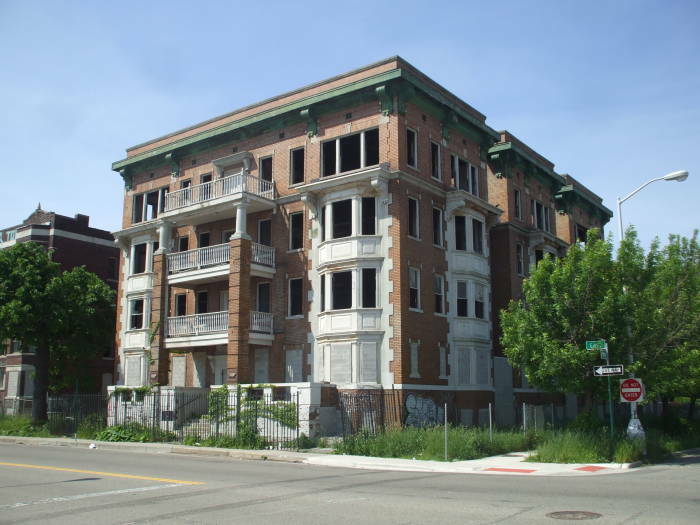 The three adjacent houses are in varying stages of abandonment and decay. 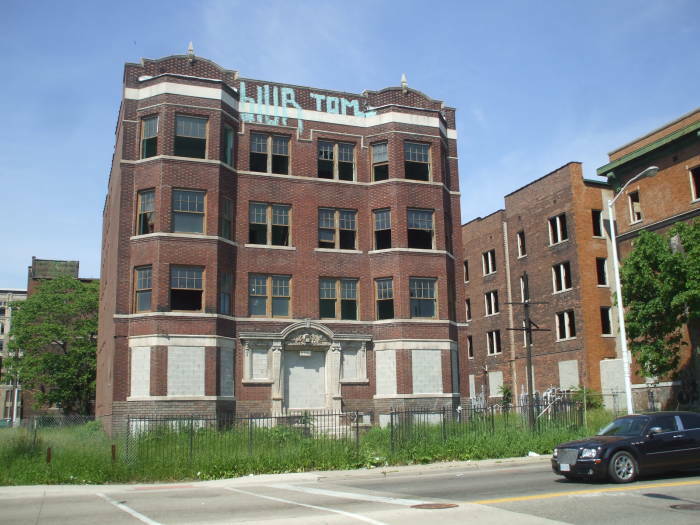 In the early 1920s, the real estate developer Lew Tuller had become a leading hotelier in Detroit. 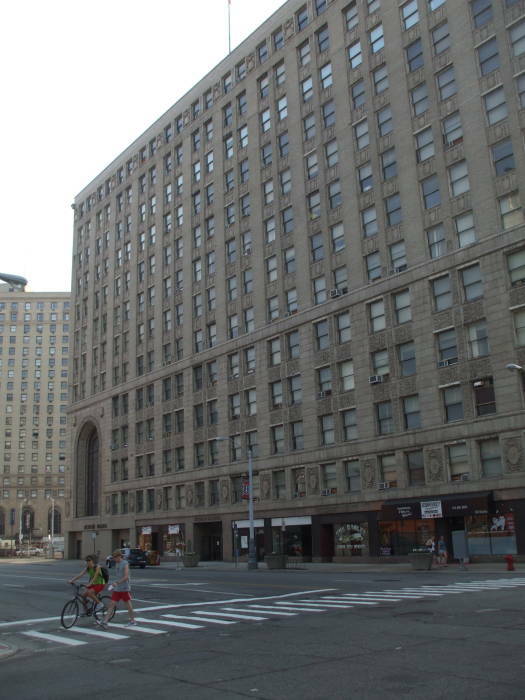 He contracted with the prominent architect Louis Kemper in 1924 to design and build three new thirteen story hotels along the central north-south Park Avenue. 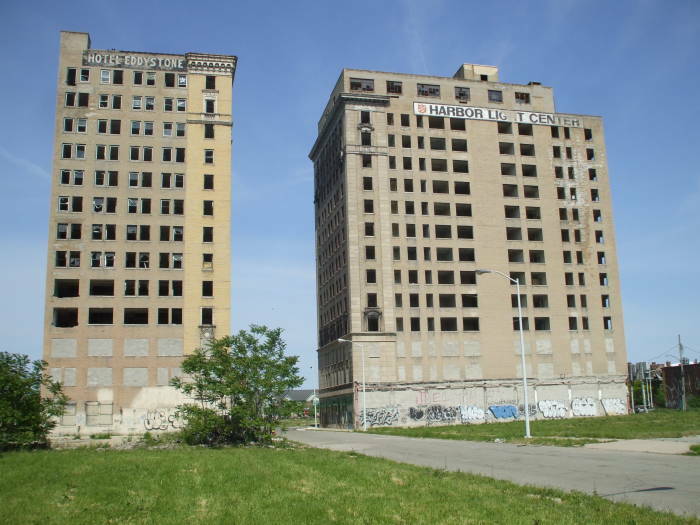 One was the Royal Palm, at 2305 Park Avenue and Montcalm. It now houses nice condominiums upstairs, and the period Town Pump Tavern on the ground level. The other two were the Eddystone and the Park Avenue, across Sproat Street from each other where it crosses Park Avenue. Those are the two you see above and at left. 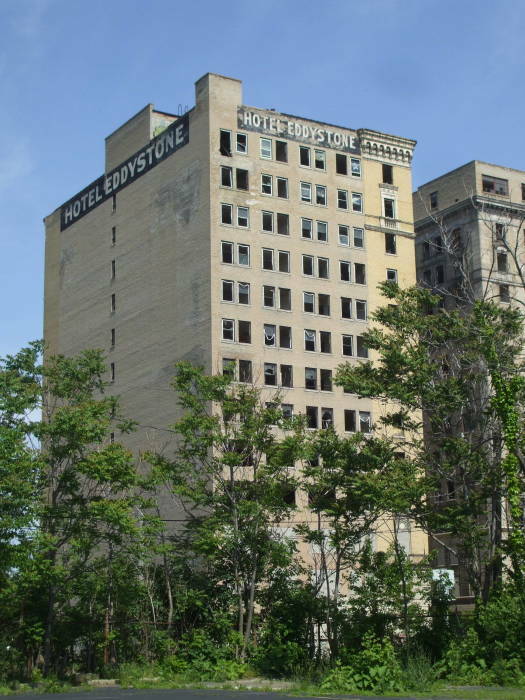 The Michigan Governor announced plans in 2005 to convert the Hotel Eddystone into 60 condominiums above street-level retail spaces. 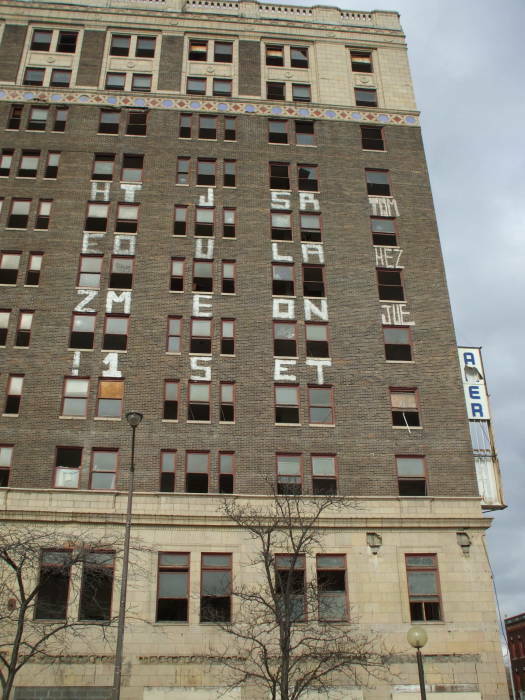 The building would be renamed The Carlton. By 2010 they had gotten as far as bricking up the lower floor windows to secure the building. 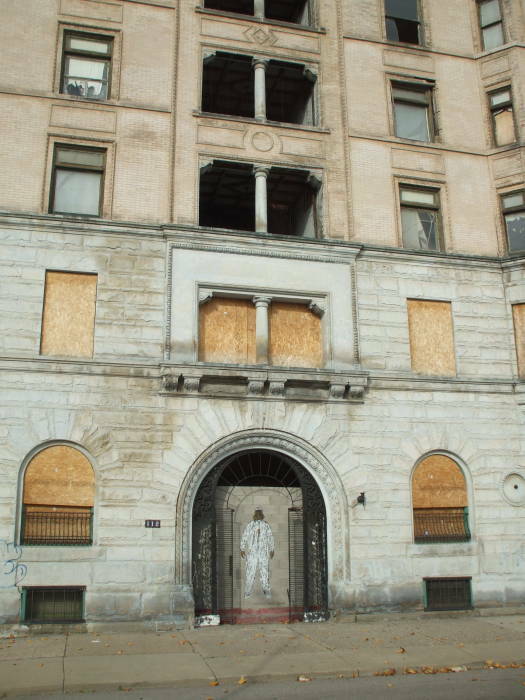 The Park Avenue Hotel, just across Sproat Street, served for several years as the Harbor Light Center, the Salvation Army's homeless shelter. 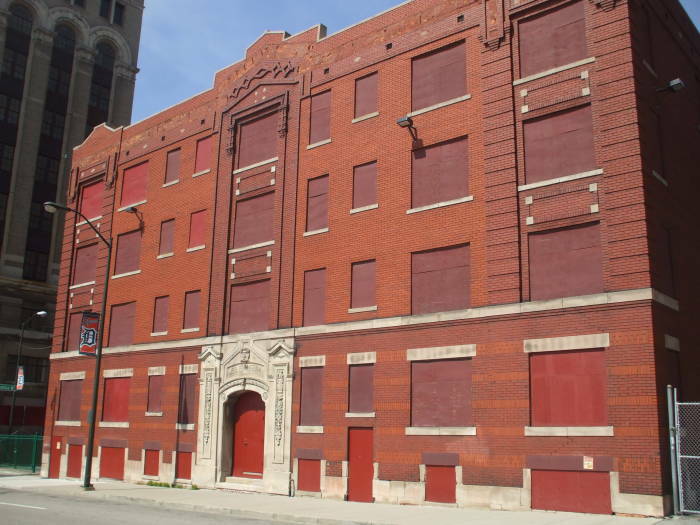 The Salvation Army moved its operation in 2007, planning to sell the building to a developer. However, they have been unable to sell the building and it now stands empty. 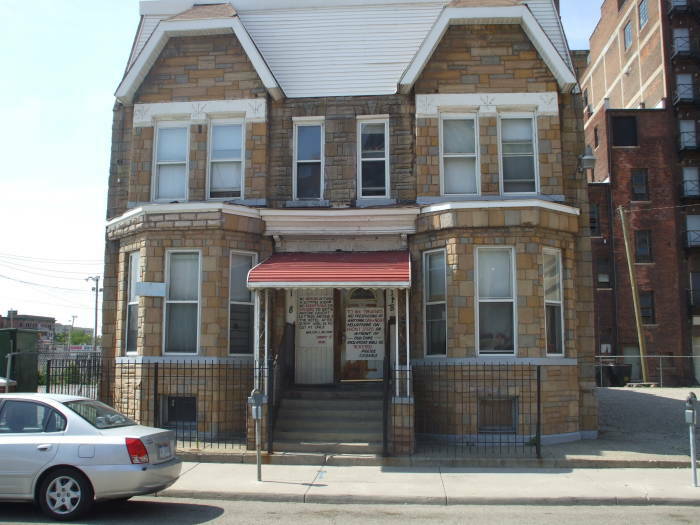 The Salvation Army has a long history in Detroit, establishing a mission in the city in 1883. 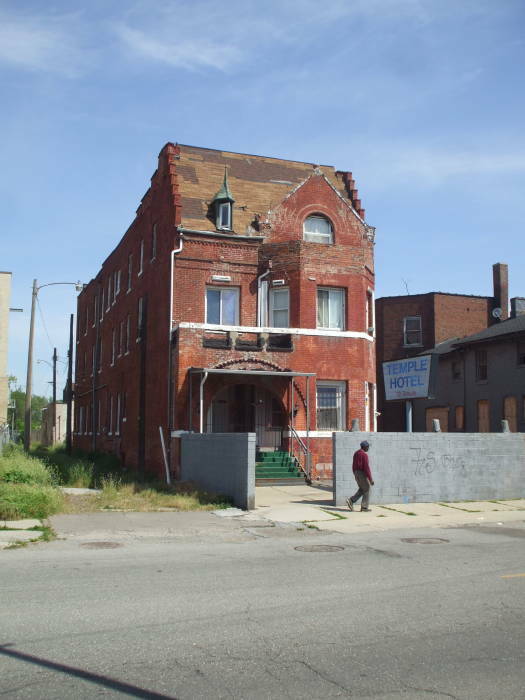 This vacant building is on the southwest corner of Park Avenue and Elizabeth Street. 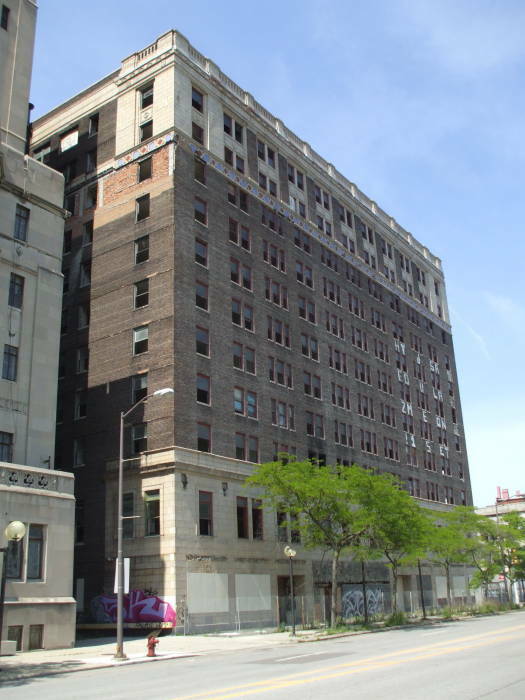 Most of its windows are boarded up through the bottom five floors. Above that, many are missing. 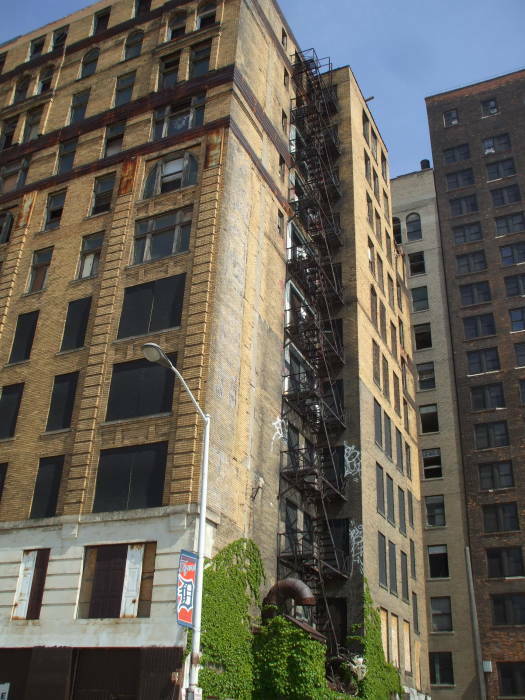 The building behind it in the second picture, facing Adams Street and Grand Circus Park, is also empty and missing many of its windows. The scaffolding at ground level suggests that something is being done here. There has been a lot of renovation in the neighborhood. 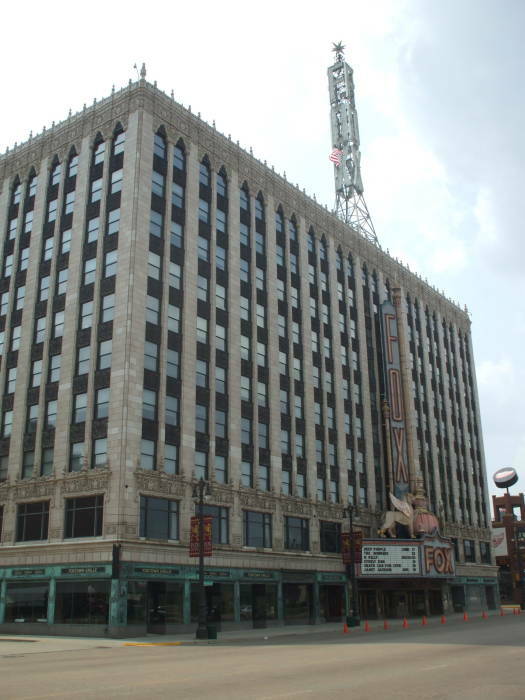 The Royal Palm is just two blocks north, and the Fox Theatre and the Fillmore are just one block east on Woodward. 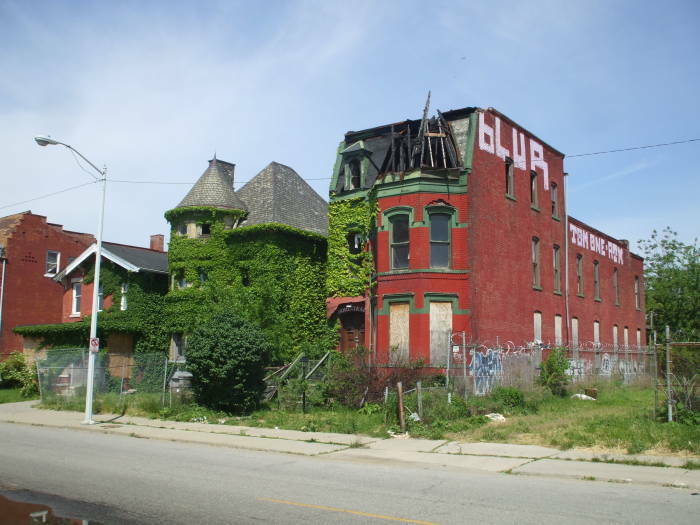 Detroit brags about its Greektown, but I didn't find it very impressive. It's pretty much just one side of one block of Monroe Street, the other side being the Greektown Casino. There are a couple of reasonably Greek places, and a couple of sports bars where you can get gyros with strips of pre-processed meat-like material. Ask for a Greek salad and you will get something based mostly on lettuce and doused with what Americans call "Italian dressing", which isn't Italian and is even less Greek. Worse yet, ask for Χωριάτικη σαλάτα or horiatiki salata. They will just look at you strangely. You should instead go to the Park Bar with the attached Bucharest Grill and get their Balkan style salad with Bulgarian or Romanian feta. That's it in the low building on the corner above. This neatly barricaded building is the Blenheim. As you might guess, it dates from the 1920s. 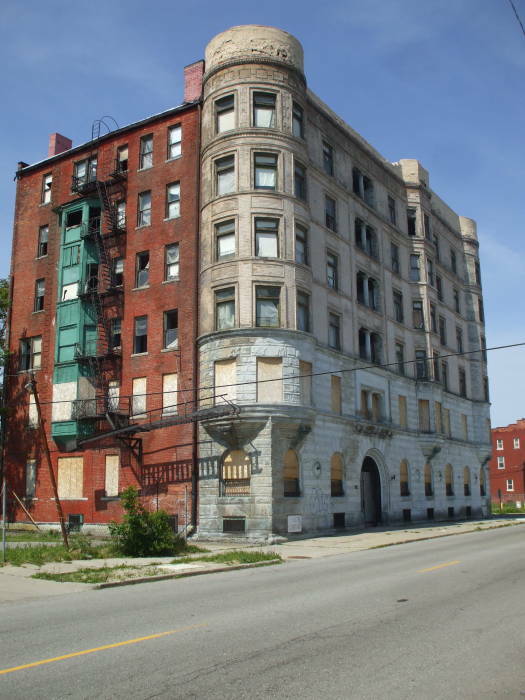 The Blenheim was an apartment house. It is said to be scheduled for renovation, but then what isn't? 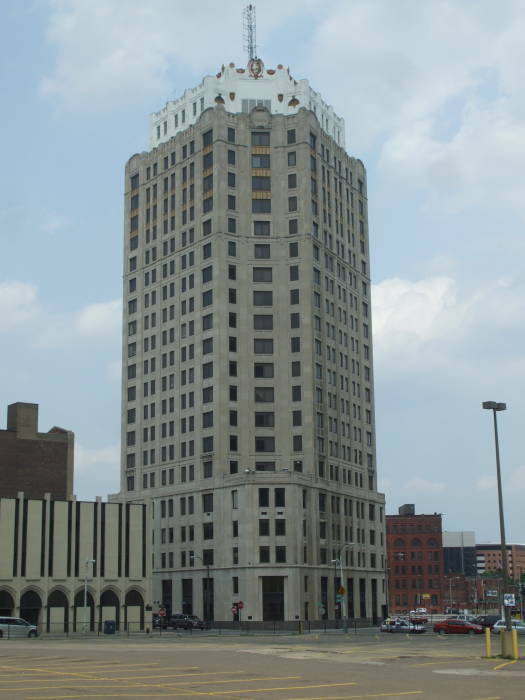 This Art Deco building is from the 1920s building boom in Detroit. 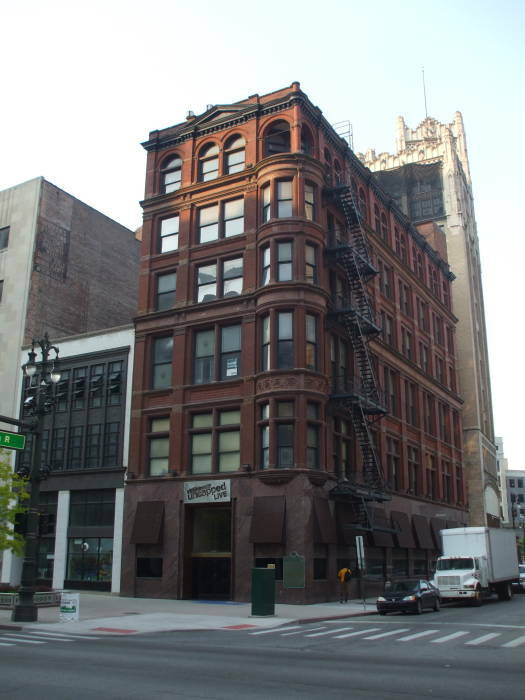 This narrow flatiron building comes to its point at Randolph Street across from the Wayne County building. 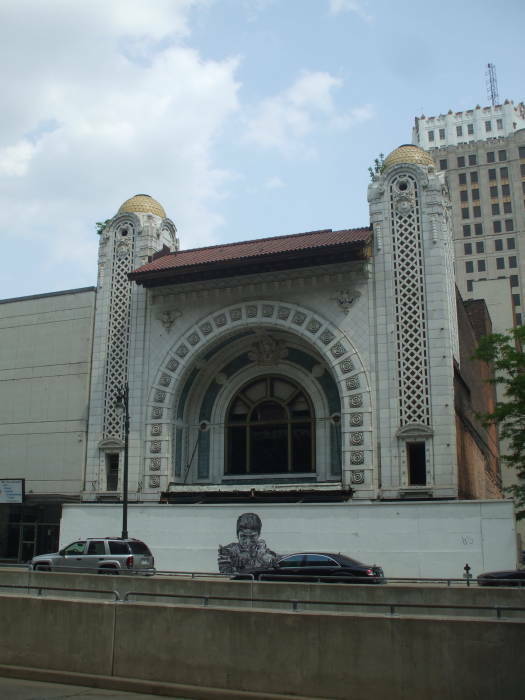 An ornate theatre sits vacant and boarded up along Monroe Street. Office towers stand largely vacant. 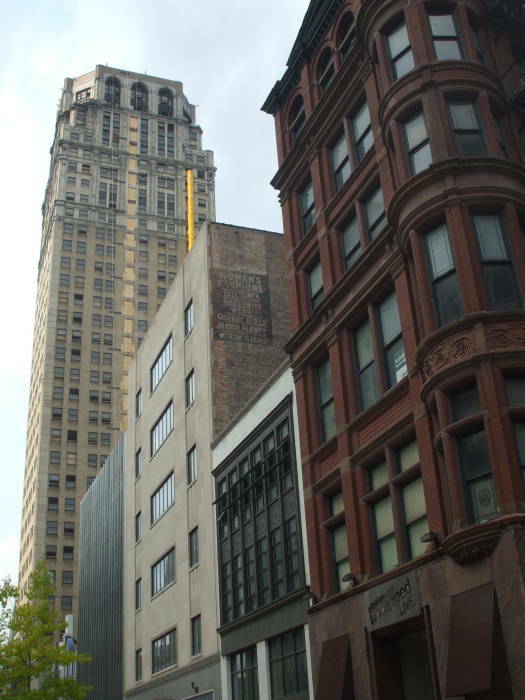 That's the David Broderick Tower at left and the David Whitney Building at right. 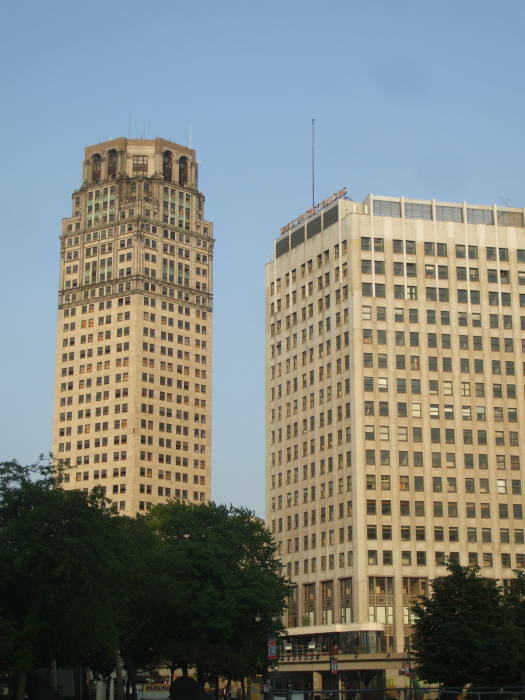 They both face the Grand Circus park bisected by Woodward Avenue. 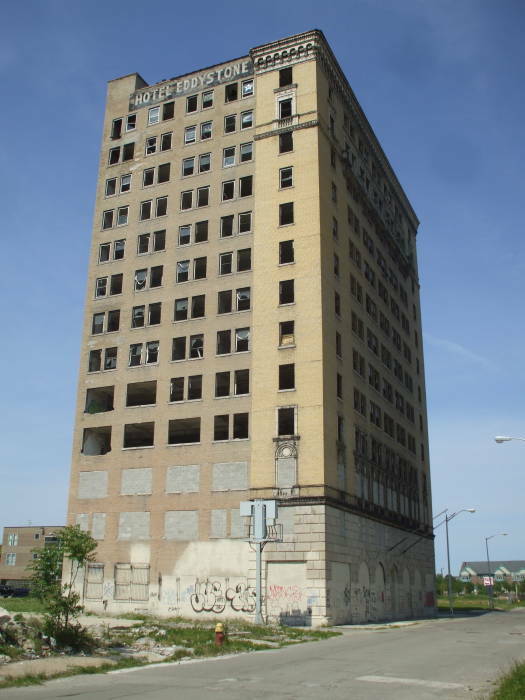 Here is a better view of the David Broderick Tower. Many buildings are ornate for the bottom two or three floors, and then above that, where you can't easily see, they are fairly simple rectangular blocks. But often, as you see here, they become ornate in their top few floors. It's almost like a relatively small elaborate structure, sometimes like a small castle or chapel, has been placed on top of a tall rectangular pillar. The Fox Theatre was built in 1928. It has 5,048 fixed seats, and another 126 removable seats can be added in the raised orchestra pit. It is the largest surviving large movie palace from the 1920s, and it was fully restored in 1988. The film mogul William Fox built five ornate Fox Theatres nationwide during the late 1920s. The other four are in Brooklyn, Atlanta, Saint Louis, and San Francisco. This one's opulent design combines Chinese, Burmese, Indian, Persian, and Moorish motifs. This was the first movie theatre in the world built with equipment for sound films. Fox Films had patented the Movietone system of optically recording an audio track on the film, and this was to be where it was shown off. The building includes the theatre itself embedded within a ten story office building. The original design had twenty retail spaces on the first two floors, then eight floors of offices above that. 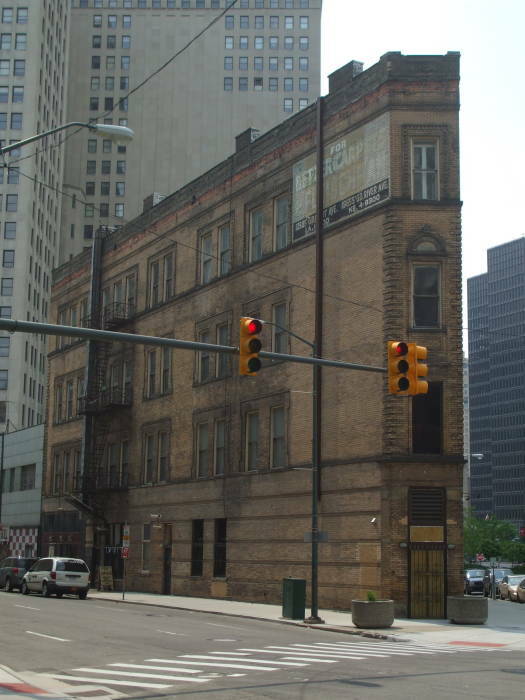 The Schwankovsky Temple of Music is one of the oldest buildings still standing in downtown. 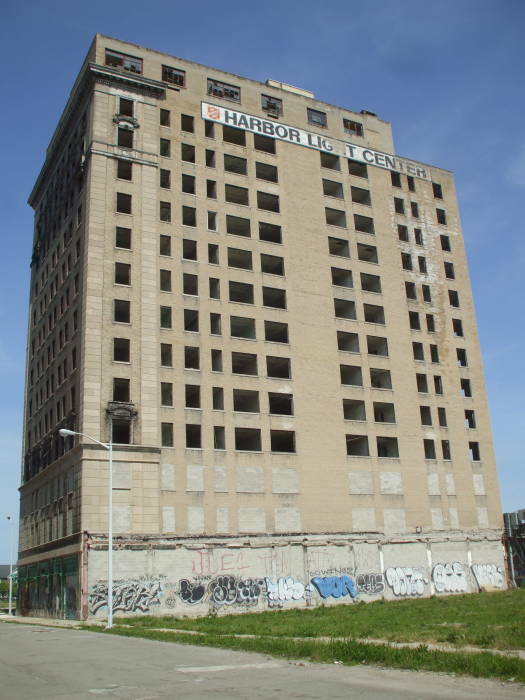 It was completed in 1891, built around a cast iron frame and the first building in Detroit with an electrical elevator. 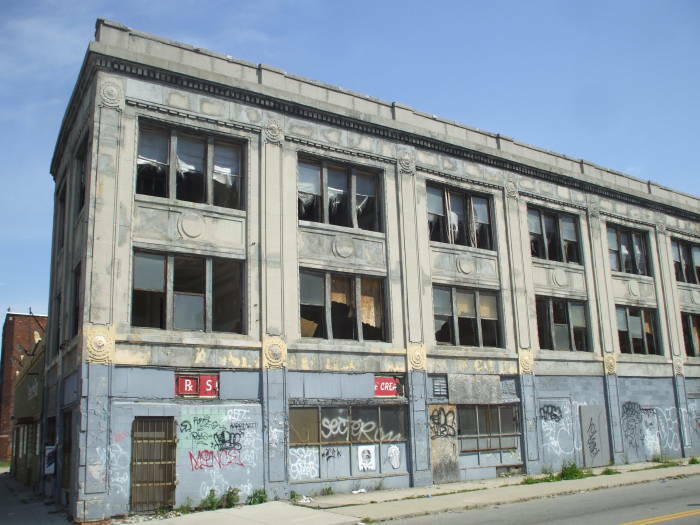 It was built for the F.J. Schwankovsky Company, a musical instrument retailer. Its second floor had a concert hall. The music company had ceased operation by 1910, when the building became a jewelry store. It housed the Wright Kay jewelry company from 1920 to 1978. It was sold in 1980 and used as the headquarters of the House of Fabrics. 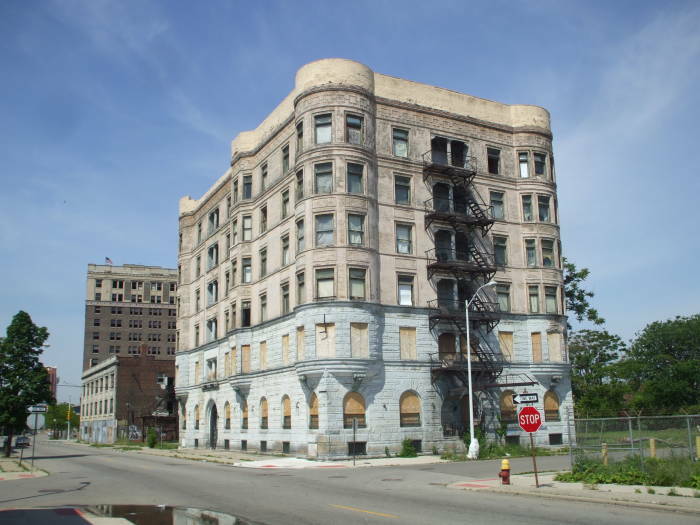 Now it has condominiums in the upper floors, and the Vain nightclub on the ground floor. 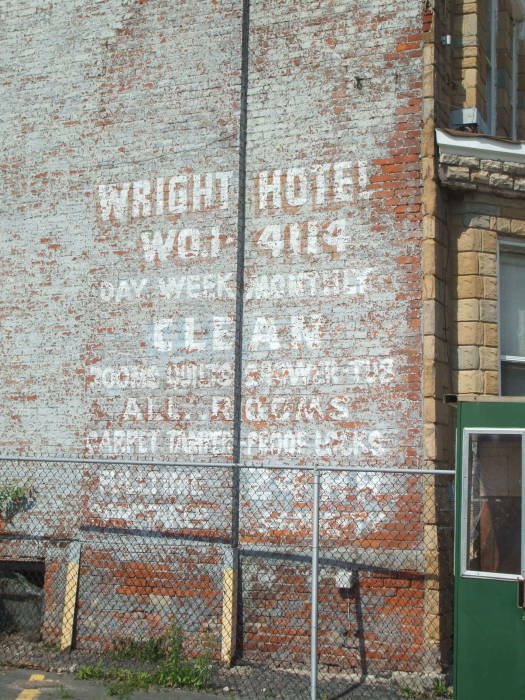 The faded sign in the second picture above has a fashion listing that I can't imagine seeing today. Well, OK, you might see this list in the seamier parts of today's Internet, on sites catering to aficionados of Tall Girls, Chubby Girls, and Junior Plenty, whatever that might be. But in a mainstream clothing store, no, I don't think so. The Hotel Milner is another thin flatiron building. The Milner hotels claim to be the first hotel chain. 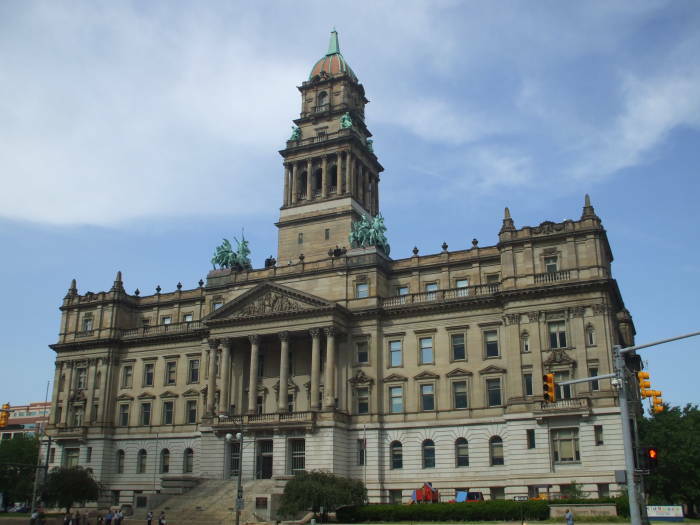 The Wayne County Building was built between 1897 and 1902. It is described as perhaps the nation's finest surviving example of Roman Baroque architecture. 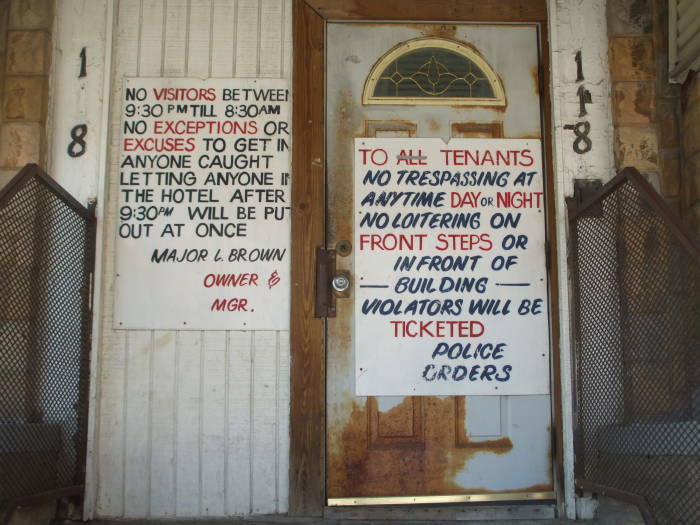 Oddly, the county does not own the building. This has led to a difficult relationship between the county government and the building's owner, and the county's plan to move its operation to a new location. 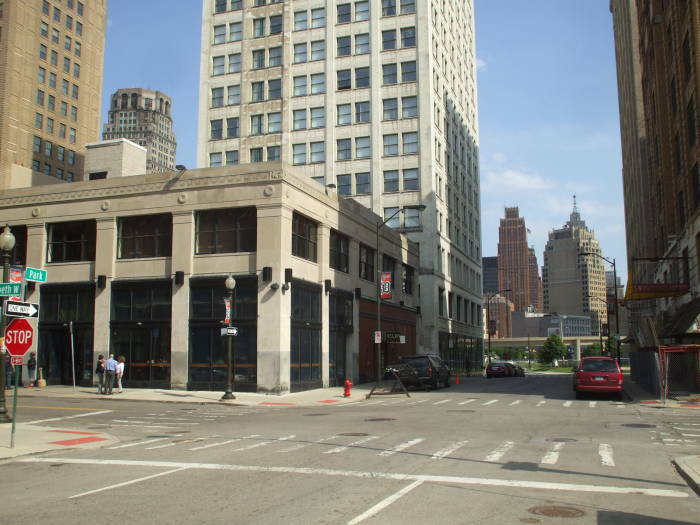 The Michigan Building is located on the east corner of the 3-way intersection of Cass, West Grand River, and Bagley. It's between Bagley and Middle streets along its long sides and West Grand and Clifford along its short sides. 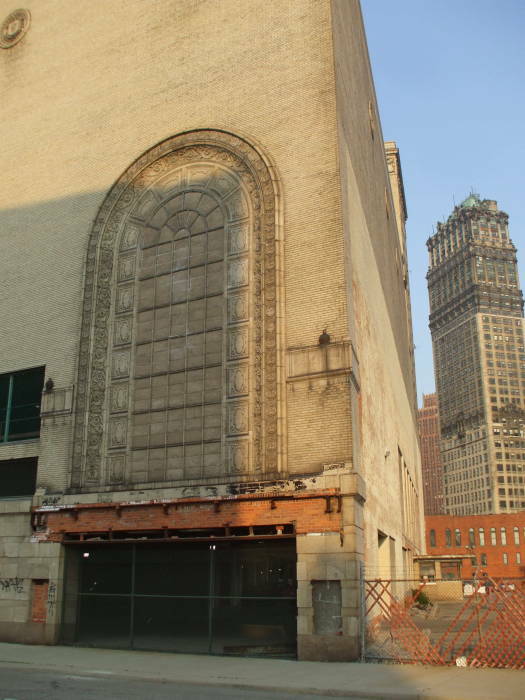 The southwest end of the building once housed the Michigan Theatre, an opulent movie palace seating 4,050 patrons. The building was constructed in 1925, with the theatre opening in August, 1926. The building itself is 13 stories tall, forming a large rectangular block of offices as seen above. The southern corner features a large arched window, apparently opening into a lavish lobby. This large arched window really opens into a shallow space with a curved back wall covered by mirrors once reflecting the lights of a large chandelier out into the street. The southwest end of the building held the enormous lobby, running across that end of the building. That was the entry into the large theatre. The theatre changed hands a number of times during the 1950s and 1960s. In the 1960s it was used for closed-circuit television viewings of sold out hockey games of the Red Wings in the nearby Olympia Stadium. In the early 1970s it was used as a nightclub and popular music concert venue, and there were numerous closings and re-openings. 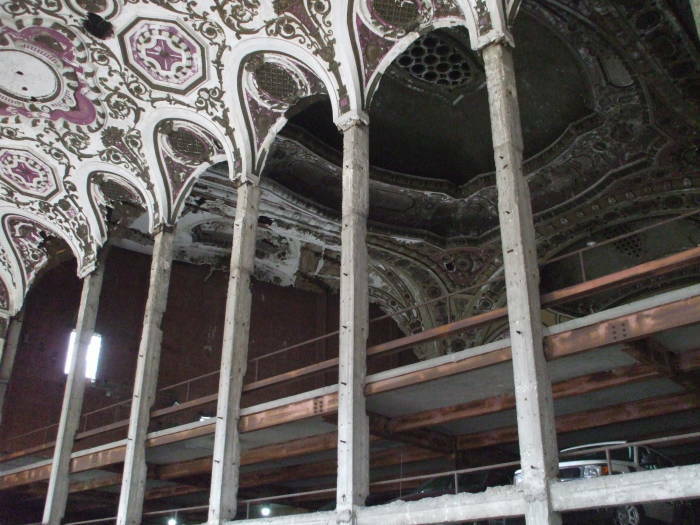 The Michigan Theatre was permanently closed and partially demolished in 1976. However, the theatre could not be completely demolished as the rest of the structure relied on it for support. Meanwhile the tenants of the office spaces threatened to leave unless adequate parking was provided. 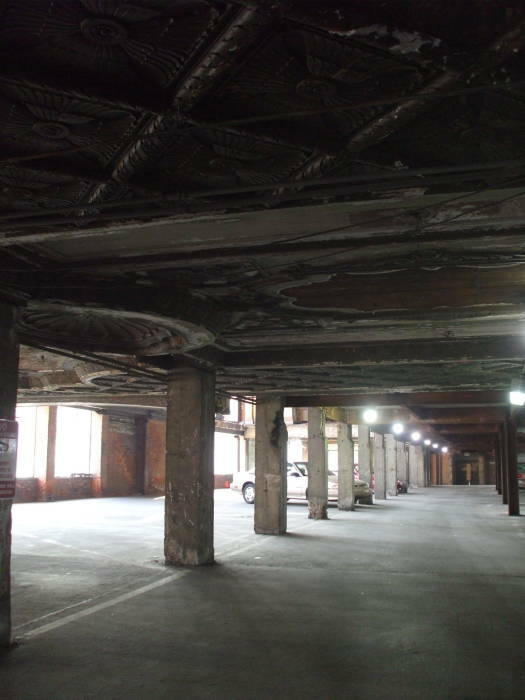 The interior was gutted and concrete parking decks installed, converting the former theatre into a multi-level parking garage. 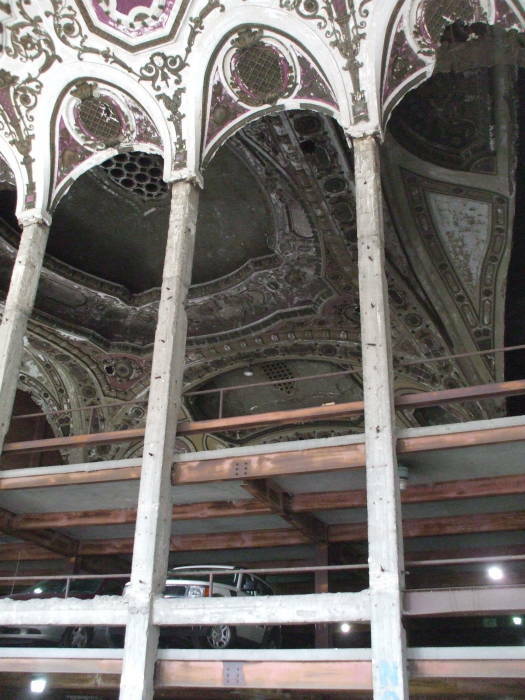 The original ornate plaster ceiling in the grand lobby and theatre itself are still intact, 9 stories above the bottom level. You can't just stroll in and look around, you have to have a parking ticket to open the automated doors. Above and below we're looking into the entry area just off the Bagley Street entrance. A similarly shaped grand window outline was over the opposite end of the lobby. Now it's over yet another chain-link barrier. The Book Building looms in the distance. If you can only look in through the chain link fencing on the openings, you can get some idea of what's inside. I came past on another day, when there was some event downtown. 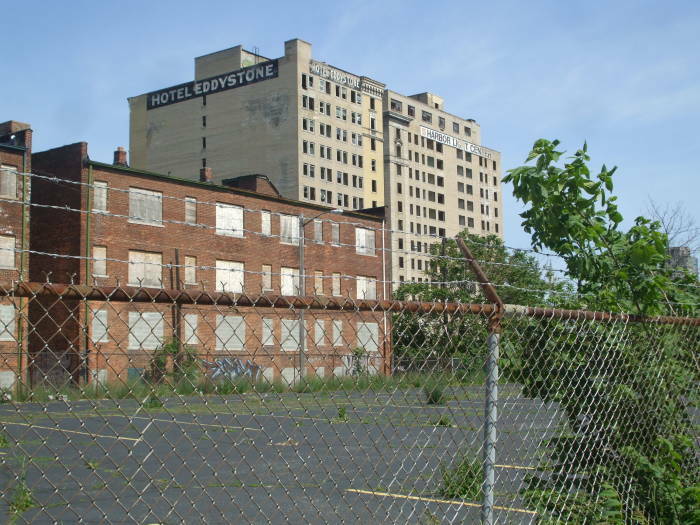 Major events like Tigers home baseball games lead to temporary workers waving flags and collecting money for parking at the many vacant lots near downtown. 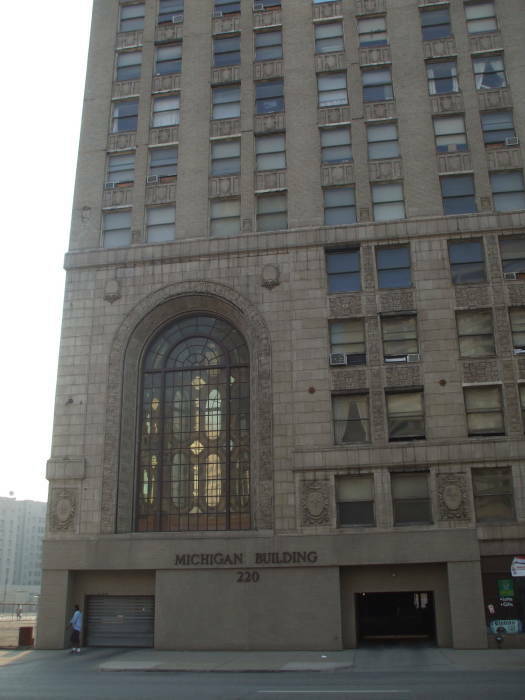 This included the lot adjacent to the Michigan building, which opens into the garage. I was able to go into the garage, at least to stand just inside the entrance and look around. On a side note, I wonder if anyone has tried to correlate the incidence of fires in unattended meth labs in southeastern Michigan with Detroit Tigers home games. 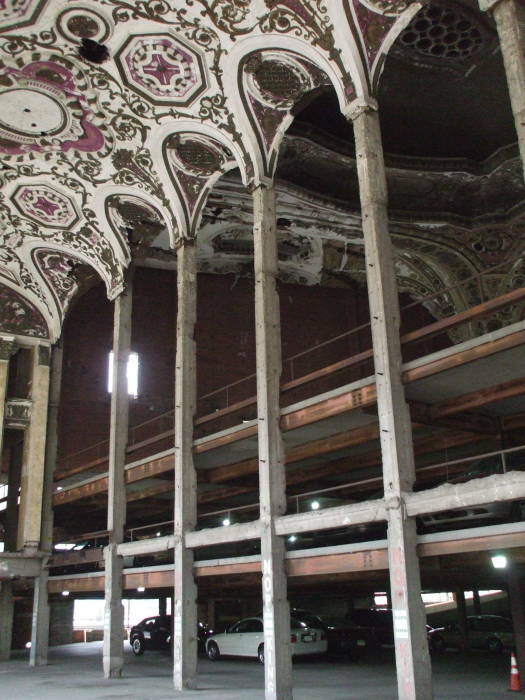 Parts of the mezzanine, the 2nd and 3rd balcony foyers, their staircases, and the projection booth are still intact. 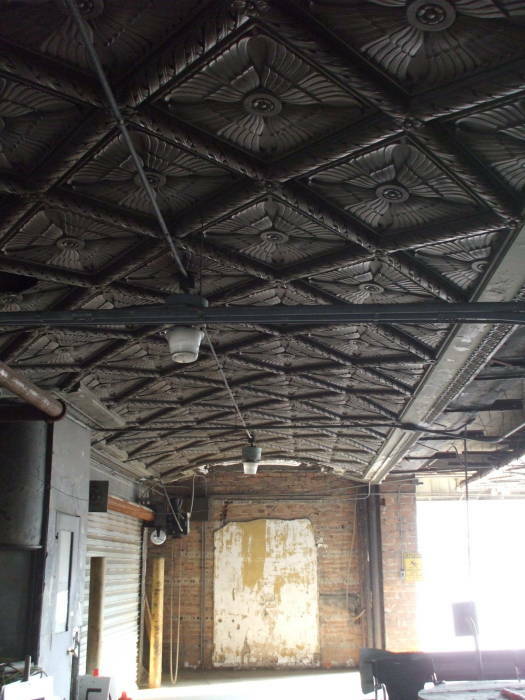 The elaborate ceiling is intact and retains most of its paint. 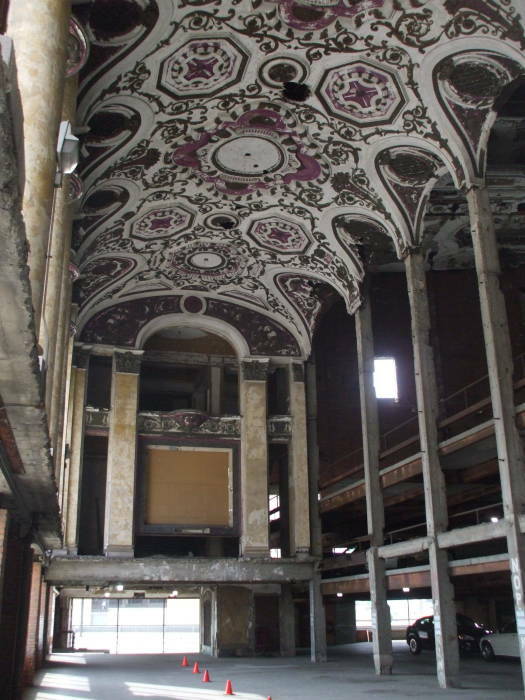 Above, we're looking up out of the lobby, through the removed rear wall of the theatre itself to the main theatre's ceiling. At right we're looking along the length of the lobby. 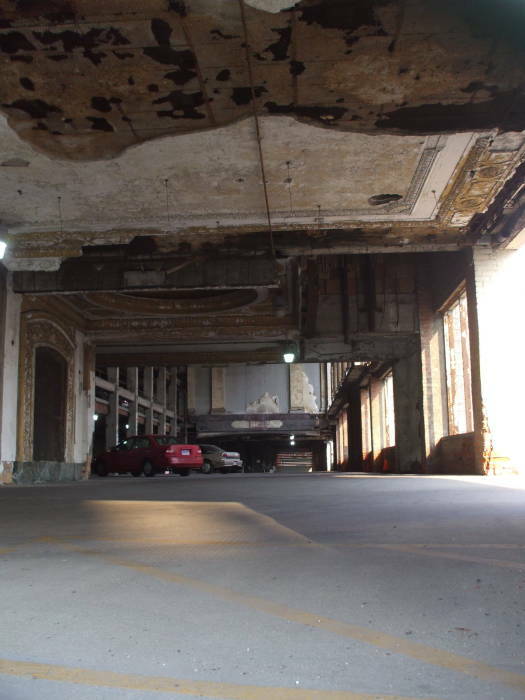 The pictures above and below show the parking ramps inserted into the main hall of the theatre. The nearby AT&T Building is a short distance to the south, with its microwave horns facing to the northwest. They're probably C band, 4, 6 and 8 GHz. They're about 100 meters above ground level, so the horizon in flat southeastern Michigan is about 39 kilometers away. Refraction may give you another 15%. 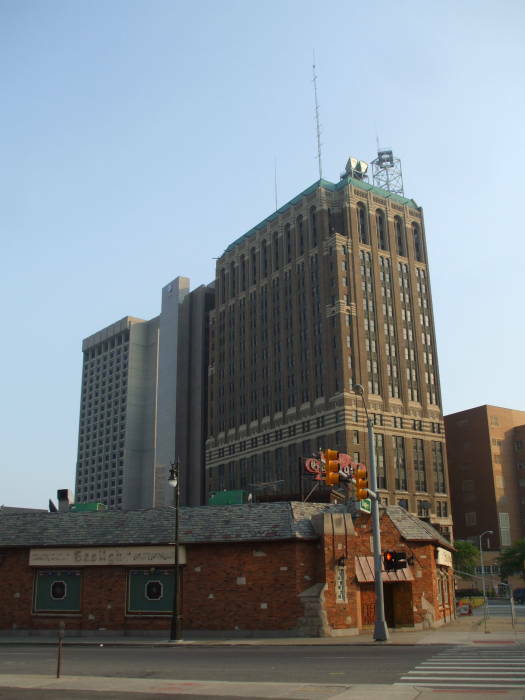 Michigan Bell Telephone Company built the original structure here in 1912. It was just seven stories tall, extending to the multiple horizontal bands of limestone seen just above the nearby traffic signal lights in this picture. Twelve more stories were added in 1927, completing the brick faced structure seen here. The bronze panels below the paired windows show lightning bolts, bells, and other communication symbols. Michigan Bell was purchased by SBC, and then SBC was purchased by AT&T. The new AT&T Building Addition is the steel and poured concrete tower behind it. It was finished in 1973, if you can't guess from the design.